Live Performance Australia (LPA) takes great pleasure in presenting our Ticket Attendance and Revenue Survey for 2015 (“Survey”). This is our 12th annual Survey. It is now the principal source of reliable industry statistics for the Australian live performance industry, and represents the most comprehensive information on ticket sales for Australian live performance events available. As the leading source for industry results and trends, the Survey is drawn upon extensively by the industry, government, media and business. The live performance industry continues to contribute significantly to our economy and cultural ecology. In 2015, 18.38 million tickets were issued to live performance events in 2015, generating total ticket sales revenue of $1.41 billion. That’s more than the combined attendances at AFL, NRL, Soccer, Super Rugby and Cricket in 2015 (Australian Sporting Attendances 2015, Stadiums Australia). In comparison to 2014, ticket sales declined in revenue by 6.7% and in attendance by 1%. This is consistent with a year of weaker consumer confidence across Australia over the course of the year. The contemporary music (including music festivals) and commercial theatre sectors, in particular, experienced negative growth. In the past decade we have witnessed a boom in live contemporary music concerts and festivals due to increased tours by international artists. We are now seeing this growth plateau, reflecting the significant challenges the live music sector faces in the years ahead. We encourage you to explore this digital report in depth. The data is broken down by both state and genre categories. This includes ballet and dance, children’s/family events, circus and physical theatre, classical music, comedy, contemporary music, festivals (multi-category), festivals (single-category), musical theatre, opera, special events, and theatre. Every year LPA seeks to expand the data we collect and report. To that end we have worked closely with the Australia Council for the Arts and the Australian Performing Arts Centres Association (APACA) to report on live performances in the small to medium sector, as well as regional and metropolitan venues, in an effort to redress the underreporting of data in these sectors. This is the second time we have collected data on small to medium companies (Key Organisations) and APACA venues, and the first year we have consolidated findings into a single report. The development of LPA’s research reports, integral to promoting the value and importance of our industry, would not be possible without the generous support of our long-term partner Media Super. Media Super has a long and respected history as a key supporter of Australia's creative industries through sponsorship programs, employment and financial education support, as well as celebrating the excellence of Australia’s cultural offerings. LPA sincerely thanks Media Super for its continued partnership and support of this research. We thank our Survey Consultants, EY, for their professional services in compiling and analysing the Survey data, and our Web Designers, Digital Bridge, for their preparation of the Digital Report. We hope you find the digital format informative and intuitive, allowing greater ease of comparison with previous year’s data and tracking of trends. Finally, we sincerely thank all Survey Participants for their provision of data to the Survey, including APACA venues that provided data for the first time this year. The generous cooperation and effort of all parties involved is, as always, greatly appreciated. One of the great things about my job is that I get to see the wonderful creativity of our members and to be with them to celebrate their achievements. So it was at the 2016 Helpmann Awards, where Media Super members presented, were nominated for and received some of the major awards. And what a celebration of the abundance and diversity of Australian talent it was! Matilda the Musical of course scooped the pool, and the performance by the Matilda kids was simply delightful. But the most poignant moment was the presentation of the JC Williamson Lifetime Award to Stephen Page by his son Hunter Page-Lochard. Over 25 years as Artistic Director, Stephen has developed the Bangarra Dance Theatre into one of our most treasured live performance companies, constantly finding new creative ways to bring the stories of indigenous Australians and their culture to life. Stephen has been a shining light for his people; indeed for all of us. Bringing such a wealth of talent to the stage doesn’t come easily, though. Our performers have all worked very hard and often with little financial support to develop their skills and ply their craft. The contribution of live performance to the cultural enrichment and health of our community is significant. It deserves funding support, not funding cuts. And that support should range across all genres and all types of companies, large and small, ‘mainstream’ and ‘niche’. 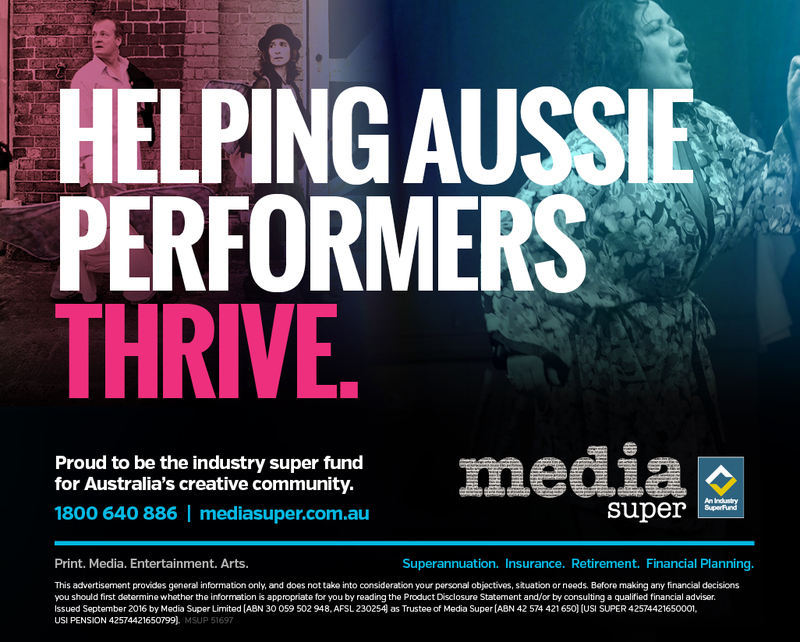 Media Super is a key part of Australia’s creative industries, providing support for awards like the Helpmanns, a range of festivals, talent development programs, business skills programs and financial education – appropriate activities for the industry fund for the live performance industry. The LPA’s Ticketing Survey provides us with valuable data and information about audience trends and the financial health of our industry. It gives us good insight into where patrons are spending their money and provides credible evidence to assist our industry’s lobbying for funding support. Partnerships such as that between Media Super and Live Performance Australia make a critical contribution to the health and vitality of Australia’s creative industries. The live performance industry experienced negative growth in revenue and attendance in 2015. This result is consistent with a year of weaker consumer confidence. Consumer confidence measures the level of economic optimism that consumers have and as such, is an indicator of their willingness to spend. Productivity in the arts and recreation industry declined in 2014/15, recording negative productivity growth of 4.3% (Productivity Commission 2016, PC Productivity Update). Strong growth in revenue and attendance was recorded for Ballet and Dance, Circus and Physical Theatre, Special Events, Comedy and Festivals (Multi-Category). Reasons for these gains varied. Growth in the Comedy category was driven by the success of internationally renowned comedians Billy Connolly and Dylan Moran who toured Australia in 2015 as well as strong attendance at shows staged during the Melbourne International Comedy Festival. The increase for Festivals (Multi-Category) was in part due to the strong growth in attendance and revenue at the Adelaide Fringe Festival and sustained growth of the Falls Music & Arts Festival in Victoria, New South Wales and Tasmania. The significant increases for Circus and Physical Theatre are due primarily to the return of Cirque du Soleil for the first time since 2013. The Special Events category tends to be volatile and is dependent on the number of performances that cannot be classified. The Doctor Who Symphonic Spectacular, contributed to the strong growth in this category. There were significant declines in the Theatre, Contemporary Music, Festivals (Single-Category) and Classical Music categories in 2015. Performances in Contemporary Music were unable to match the growth recorded in the previous two years. Major international acts, such as Katy Perry, Bruce Springsteen, Bruno Mars and Eminem, whose successful national tours were a contributing factor to the high revenue and attendance results recorded in 2014, did not return in 2015. The significant decline in both revenue and attendance for Festivals (Single-Category) is in part due to the cancellation of the festival Big Day Out in 2015. Despite strong growth in theatrical productions among AMPAG companies, there was a significant decline in the number of commercial theatrical productions throughout the year. Large commercial productions, such as Mrs Brown’s Boys, that generated strong revenue and attendance in 2014, did not return in 2015. In 2015, approximately 18.38 million tickets were issued to live performance events in Australia, representing a decline of 0.9% on 2014 when 18.54 million tickets were issued. Of the 18.38 million total tickets, the number of paid tickets was 16.12 million, a decline from 16.47 million sold in 2014 while the remaining 2.26 million tickets issued in 2015 were complimentary, sponsor and zero-priced tickets. Ticket sales in 2015 generated total revenue of $1.41 billion, down 6.7% on 2014, when ticket sales totalled $1.51 billion. This decrease in revenue occurred as a result of a decline in the total number of paid tickets, attendance and average ticket price. Between 2008 and 2015, industry revenue has increased by 33%, despite falling in 2011, 2012 and 2015. Over the same period, total attendance increased by 16%. The compound annual growth rates (CAGRs) for revenue and average ticket price between 2008 and 2015 were 4.1% and 1.9% respectively while the CAGR for attendance for the same period was 2.2%. However, these trends do not account for the inclusion of new data providers over time. On a like for like basis, industry revenue increased by 14% between 2008 and 2015, with a CAGR of 2.1% and total attendance experienced a slight decline of approximately 0.2%. This year's Survey report incorporates the ticket attendance and revenue for Key Organisations (via the Australia Council for the Arts) and a selection of venues that are members of the Australian Performing Arts Centres Association (APACA). This supplementary dataset has been compiled to provide a representation of the small to medium sector, as well as regional and metropolitan (non-capital city) venues. This new data is reported separately to ensure comparability to previous studies, and is referred throughout this report as "Supplementary data". In 2015, approximately 1.56 million tickets were issued to 7,736 live performances in Australia at regional and metropolitan venues and by the small to medium sector, as represented through the Australia Council’s Key Organisations and APACA member venues, generating revenue of $43.6 million. These 1.56 million tickets are in addition to the 18.38 million tickets that were issued by ticketing companies, self-ticketing venues, event promoters and Australian Major Performing Arts Group (AMPAG) companies. Overall in 2015, 19.94 million tickets were issued to live performance events in Australia with total ticket sales of $1.45 billion. The top 5 categories by revenue and attendance are a reflection of the type of works produced by Key Organisations, and the type of shows touring regionally. Consistent with the Ticketing Survey data, Contemporary Music appears in the top 5 categories in the industry. However, there are a number of differences between the two sets of data. In particular, Comedy’s share of attendance and revenue is significantly higher than its share reported in the Ticketing Survey data, with Comedy accounting for 12.4% of industry share of revenue, mainly due to attendances at regional and metropolitan venues. The Melbourne International Comedy Festival: Roadshow 2015 most likely contributed significantly to the Comedy category. There are also some differences in the ranking of total revenue and attendance. Children's/Family ranks higher in attendance than revenue due to the low average ticket price while Comedy ranked higher in revenue than attendance due to the high average ticket price in this category. It is important to note that the data included is not a comprehensive survey of regional and metropolitan venues, as only 45 APACA member venues out of a total of 108 non-capital city member venues provided data. This includes a mix of small and large regional and metropolitan venues. Whilst attempts have been made to remove data that was previously captured in the data provided by major ticketing companies, self-ticketing venues, event promoters and Australia Major Performing Arts Group (AMPAG) companies, it was not possible to match individual performances as the regional and metropolitan data provided was aggregated at the venue level.